Over the past few years we have heard of so many stories of this happening to families around the world! We want to help put an end to this! We are making great progress but we want to do more! We ask for your continued prayers and help to stop the choking game! Together we can make a difference. Listed below are ways you can Take Action to expand our reach to educate other. If you suspect that your child is playing the choking game, talk to him or her. Avoid making accusations. 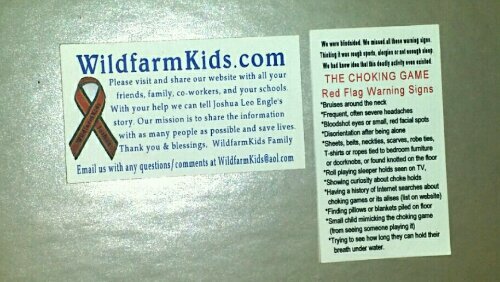 Instead, in an interested or matter of fact casual voice, ask your child if he or she has ever heard of or played the choking game. Also, ask if they know of friends who play it. Ask him or her to explain it to you, (this will give you the parent or caregiver more insight to child’s involvement, if any). Now go forward and explain the risks and remind your child that there’s no safe way to play the choking game. If your child admits to playing the choking game, tell him or her that it’s important to stop. In addition, consult your child’s doctor and a mental health provider. They may have advice on additional steps you can take to help your child. Be sure to alert the parents of other children who may have played the choking game with your child. It is not “taddling”, it is saving a life. This activity is spread by kids telling and showing other kids at various places including at sleep overs, camps, locker rooms, and basically any place kids gather. The key is to not accuse child, if warning signs are present you may feel frustrated and demand answers. This can trigger the “I don’t know” response. Be calm, and remember, this is a teaching moment and giving them the correct facts is what is important. Go to your school and ask them what they do in this situation. Find out how much the administration in your child’s school actually knows about this. Don’t be afraid to talk about this, you could save lives. This is real and happening everywhere. Encourage schools to host forums on this. share this link. This is an article published in the NASRO magazine for all school resource officers to share. Witten by Ken Tork the official public spokesperson for the organization ED4ED. We encourage you to share this link with teachers and administration. Presentations are quick and easy. We can customize them for you. They can be added to agenda of most gatherings; club meetings, board meetings, retreats, conferences, study groups, work, school ect. It can be tailored to be age appropriate. We prefer speaking to adults and when talking with youth, written permission is required and/or parents attend if possible. We can also answer questions afterwards. We can set up information table at your events too. Donate a few moments of your time. If you like our post please share it via your personal social media. We have tools at the end of each post this makes easy sharing for our readers. Our website will then reach your family, friends and theirs too. This is a quick and easy way to support us. We value your time and appreciate this action . Donate money that will be used to pay for materials for schools, counselors, awareness flyers. Our biggest expenses are paper, printing and postage. Click for our gofundme link. If you hear children talking about the game under any of its various names, intervene. Don’t be afraid to say something or question other children about this. Pease continue to share our site with friends and family. Never hesitate to contact us if you gave questions. Awareness starts with you.